Several stonking walks from this high hut in the high swing of border mountains at the head of the Stubaital. It is a stiff 900m climb to the Nürenberger Hut, but the walking fireworks above it make the effort very worthwhile - and it is a lovely walk in its own right. There are several top-notch walking options from the hut. The Stubaier Höhenweg comes through here, with alternative routes onward, to the Sulzenau Hut to the west. then in both cases onward to the Sulzenau hut. These can be combined to make a thrilling circuit. The views from Mairspitze in particular are truly magnificent panoramas of the high Stubai border ridge, with its dark rocky drama and still-gorgeous but tragically disappearing glaciers. A brilliant day's walk, 5-6 hrs. If energy or time does not allow, consider climbing the Mairspitze in a 3.5 hrs or so round trip. A demanding climb, but unforgettable views. One of the Stubai's easiest-climbed major peaks on the high border ridge with Italy is 3,419m Wilder Freiger, via the 2,805m Seescharte pass (further along the same ridge from the walks above). This is a serious undertaking, as it involves quite a bit of glacier and icefield walking, so needs experience and careful preparation – or a good guide. The views from the top are, needless to say, sublime. 9-10 hrs return – or you can continue on to the Sulzenau hut. You can climb to the Seescharte in 2hrs+, for superb closer-up views of the high peaks and glaciers. 1hr+ back. An hour up the valley from the hut, over glacier-smoothed rocks which nestle pretty pools, and then across a wide, gravelly bottom, is the stunning mineral-blue Freiger See glacial lake, fed by a tumbling cascade-stream from the now sadly reduced glacier in the great bowl above. The Seescharte is high above to the west. A 'different' walk, and not to be missed if time allows. See William Mackesy’s account of walking most of these walks. 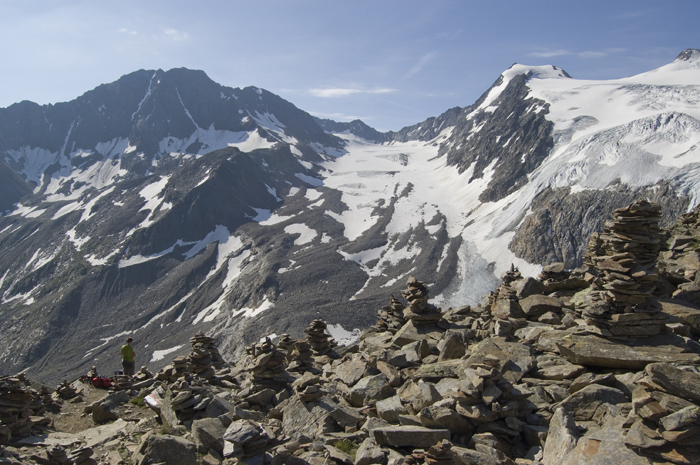 The Hohe Tauern are well loved, and well walked, so you won’t feel alone on the main routes, although you can get away. This can be tough walking in high and remote mountains with uncertain weather. Come fully prepared. Walking in Austria – Kev Reynolds for Cicerone: more than 100 walks in the Austrian Alps, including 18 in The Stubai, including 2 here. As usual, an inspiring book (indeed, Walkopedia was alerted to some of these routes by it), packed with valuable information, including good detail on the routes. As Austrian maps are good, Walking in Austria has less on each walk that some other Cicerones, but that is fine. Recommended. Find relevant books on Amazon. We would like to grow this page further. Please help us by making suggestions and sending photos! Thank you! For more information and photos, including detailed practical information and some warnings, see our Höhe Tauern walk page. The climb to the Nürenberger hut is a demanding 900m, but a fine walk with the joys of the highlands as your reward.